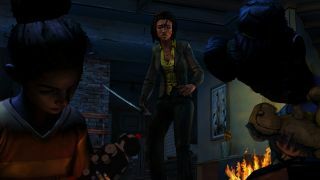 The six-minute preview of Telltale's three-part “mini-series” adventure The Walking Dead: Michonne covers what is clearly the game's tutorial, intended to help players become accustomed to its mechanics without burying them in decisions or details about the story. But it also sets a tone that, if you're at all familiar with the series, is about as happy as you'd expect. Michonne, who's portrayed in the game by Samira Wiley of Orange is the New Black fame, lost her family to the zombie apocalypse in a very literal sense: She was out of town when the outbreak occurred, leaving her two young daughters in the care of a nanny, and doesn't know (and likely never will) what fate ultimately befell them. As you can see in the video, it weighs upon her. The first episode of The Walking Dead: Michonne, “In Too Deep,” will be out on February 23. Part two, “Give No Shelter,” will be out in March, followed by “What We Deserve” in April. Find out more at telltalegames.com.